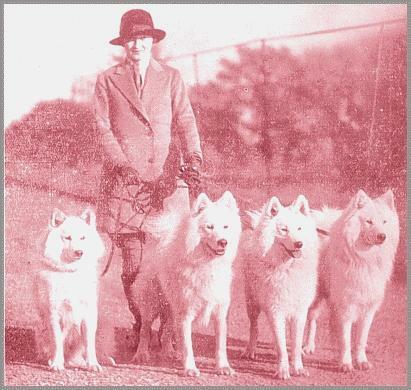 A Stud Kennel of Famous Young Arctic Dogs, at Oak Hall, Haslemere. 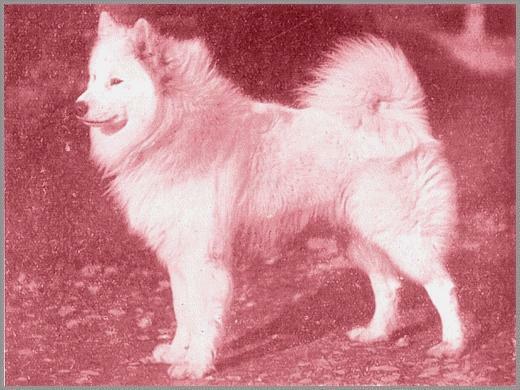 SUCH is the life of these beautiful young Samoyed dogs, thus giving them every advantage of developing a perfect standard of the breed. They themselves are of the best breeding, and represent all the well-known kennels in the country. They are true to type, with ample bone and strong physique, the snowy whiteness of their silver-tipped coats enhanced in beauty by the striking contrast of their jet-black points. 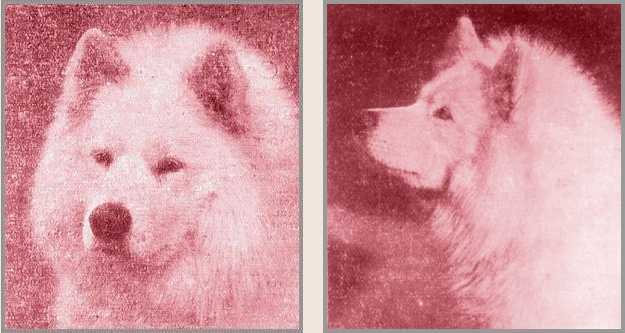 Each of the four dogs shown in the team — from left to right, FOAM (2 years), LOGA OF THE ARCTIC (2,5 years), ZONE of THE ARCTIC (12 months), FOHN OF THE ARCTIC (19 months)—has the distinction of having secured a red ticket on his debut at a championship show; while LOGA OF THE ARCTIC has been beaten only once at a championship show in his classes (having now reached the Special Limit), and has been awarded his 1sts by fourteen different judges. The study of his beautiful head expresses the true nobility of the character of the breed. Their intelligence, strength, endurance, and faithfulness make a direct appeal to men; their beauty and refinement attract all women; while their dignified gentleness makes them the ideal companions of children. 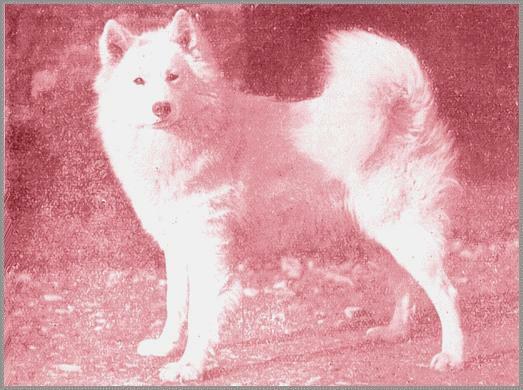 Another photo shows ZONE OF THE ARCTIC, the beautiful puppy of his sire, LOGA OF THE ARCTIC, ex WINTER. True to type, pure in colour, and dense black points, he is a worthy offspring of this kennel. Lastly, there is the magnificent young dog, FOHN OF THE ARCTIC, with a coat of pearly white, lovely black points, and ample bone. He has been shown eleven times, and has proved his worth by securing twelve 1sts, six 2nds, and one reserve. Let us keep up the standard of this canine aristocrat by using the right dogs for stud. Loga of the Arctic, five guineas; Fohn of the Arctic, four guineas; Kola of the Arctic, three guineas; Foam, three guineas.